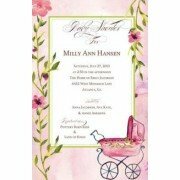 This 5.75" x 8.75" invitation is perfect for a girl or boy baby shower. White envelopes included .. 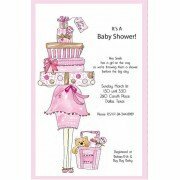 This 5.75" x 8.75" invitation is perfect for a girl shower. White envelopes included. .. 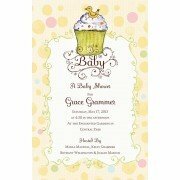 This 5.5" x 8.5" is perfect for either a boy or girl baby shower. White envelops included .. This 5.5" x 8.5" invitation come with white envelopes. .. 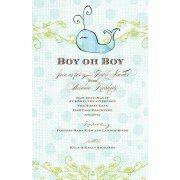 This 5.5" x 8.5" invitation is perfect for either a boy or girl baby shower. White envelopes incl..
A mom to be is leaning against a box with a giant teddy bear on this stylish invitation. Colors i.. 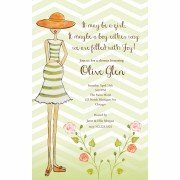 This charming 5" x 7" invitation is perfect for either a girl or boy baby shower. 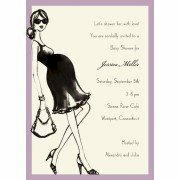 Envelopes..
Mod swirls frame your wording and a couple laden with gifts on this fun baby shower invitation. C.. 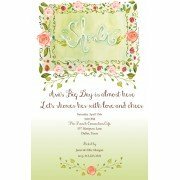 Size: 5.75" x 8.75" Includes: Invitations and Envelopes Processing Time: If ordering unpr.. This 5.5" x 8.5" invitation is perfect for any kind of shower. White envelopes included .. 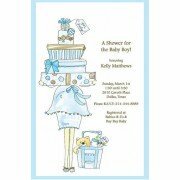 This fun 5.5"x 8.5" baby shower invitation is perfect for either a boy or girl baby shower. White.. This 5.75" x 8.75" invitation features a small pink whale on a blue, green and white card. White .. 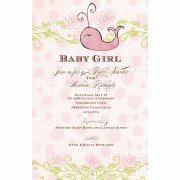 This 5.75" x 8.75" invitation features a small pink whale on a pink, green and white card. White ..